Spend a day in another country without the need of a passport, visit a land of mountains, legends and magic, the historic and beautiful land of song, the wonderful country of Wales!! We leave London and head west, travelling through some of England's finest scenery by driving through the heart of the Cotswold region and down into the valley of the River Severn to the Welsh borderlands. 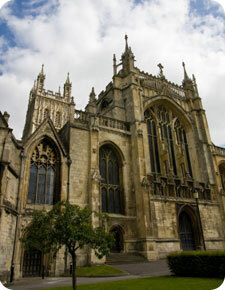 Our first stop will be in Gloucester, with its magnificent cathedral and historic 18th century docks. Here, your guide will tell of the city's connections with world trade and the development of the American colonies, we will learn of the gruesome death of one of our kings, Edward II, now buried in the cathedral, and see where some of the scenes from the Harry Potter movies where filmed. We musn't forget another Potter, namely the writer Beatrix, who's Tailor of Gloucester had a house nearby. 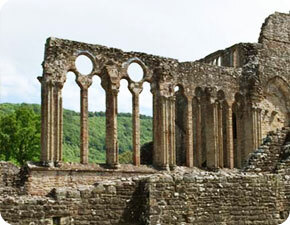 We then move towards Wales, onwards into the Royal Forest of Dean, where monarchs hunted and played sport, across the border, down to the River Wye and the town of Monmouth, birthplace of King Henry V.
We follow the Wye Valley to the romantic ruins of Tintern Abbey, once the richest abbey in all of Wales. Made famous by the poetry of Wordsworth and portrayed on canvas by Turner. 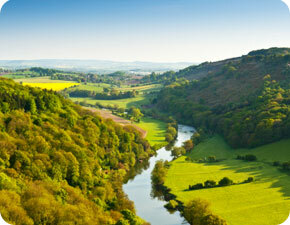 Tintern Abbey and the Wye Valley show nature and mankind in harmony with stunning views in every direction. There will be plenty of time for lunch in one of the riverside inns and cafes. There are well stocked souvenir shops in the village of Tintern Parva and a craft centre at the Abbey Mill. Following the river further downstream to its confluence with the River Severn, we end the day at the ancient sea port of Chepstow with its town walls, fisherman's cottages and impressive castle, the oldest stone castle in Britain. The border with England is very close by, in fact one can walk between the two countries by crossing the river via the old town bridge. 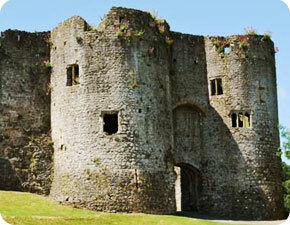 The castle hugs the cliff edge along the Wye and affords spectacular views from in or outside the fortress itself. We leave Chepstow by crossing the mile long Severn suspension bridge over the Wye and Severn estuaries and back into England then eastwards to London. Services of a Tour Guide throughout. Visit to Gloucester Cathedral (subject to services). The typical group size on this particular day trip is 30-40 people. You will travel by 49 seater luxury air-conditioned coach in a shared experience with one of our professional guides. 07:30AM outside Gloucester Road Tube station exit. 08.00AM from International Students House, 229 Great Portland Street, London W1W 5PN. Opposite Great Portland Street Tube station.